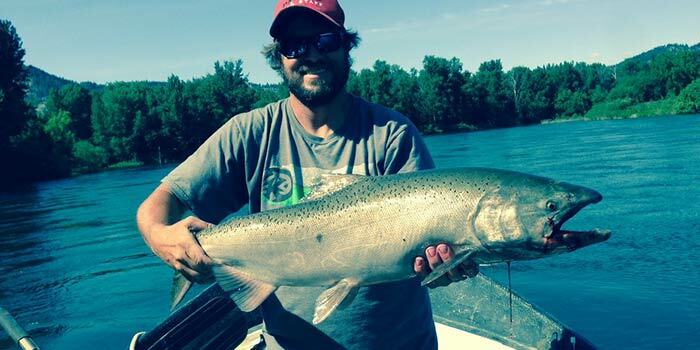 We offer spring chinook trips down the very scenic Icicle and Wenatchee rivers. We float through beautiful mountain canyons in pursuit of one of the tastiest, best fighting and most prized salmon of them all! We do most of our spring chinook or “springer” fishing out of our 18′ fiberglass Clackacraft Clackamax drift boat with some trips out of our Star Inflatables whitewater raft with full fishing frame. On an average trip we will be using a variation of bait techniques including plunking, back bouncing, float fishing, and divers and bait as well plug fishing. Trips usually start early in the morning and last at least 8 hours or until limited. As with all trips we supply all the gear, including quality rods, and we team up with Pautzke Bait to guarantee the best bait possible. On the trips all you need is your fresh water fishing license and salmon punchcard with Columbia river endorsement,and your own food and drink. Dress appropriate for the current conditions, including sunglasses and sunscreen, not the aerosol kind. We offer morning and evening trips. The cost is $200 per person with a 2 person minimum. Half day trips are $150 a piece with a 2 person minimum. We can accommodate singles as well. There is a deposit of half down payable below as a deposit, if the trip is cancelled less than 14 days before the trip the deposit is forfeited. These prices do not include gratuity. These are some of the most treasured trips of the year and I will book solid so I suggest booking early to guarantee a spot for this amazing fishery. I have fished this fishery for over 25 years and have had the privilege to catch countless fish here. I am fully insured, first aid and CPR certified, as well as a certified Coast Guard Captain. Book your next memory of a life time now!